You may have heard of Zapier by now. It helps you easily connect web services so you don’t have to code API requests. Imagine you want to trigger sending a letter out using Stannp whenever you have a new customer register on your Magento online shop. 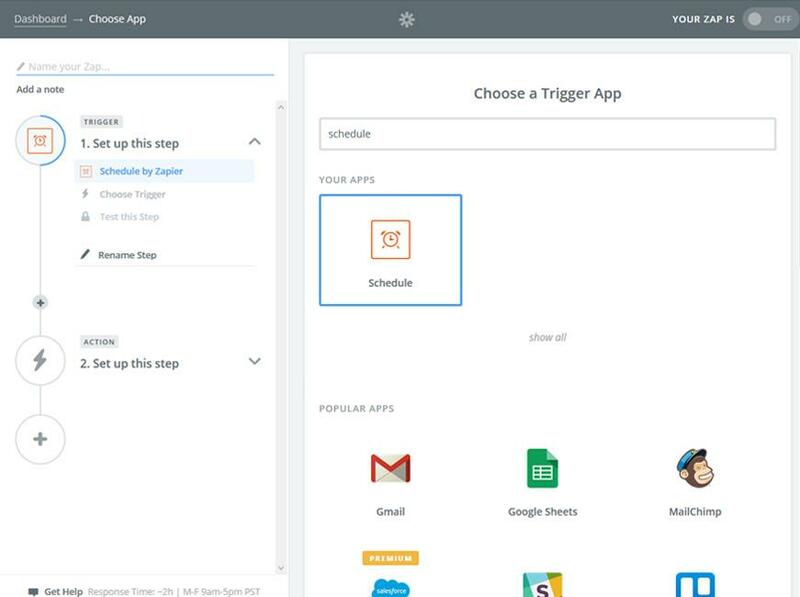 With a few clicks Zapier can set that automated process up for you. Step one is to accept our invite by clicking this link. 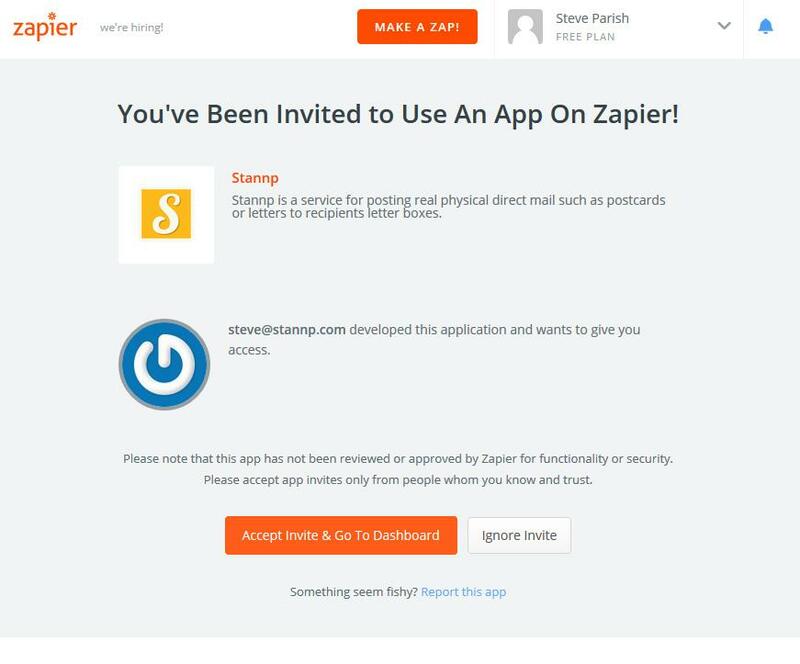 Stannp is currently an invite only service on zapier. We are building a few more actions before we go live. Now you have access to Stannp actions such as create a letter or postcard. Hit the “Make a Zap” button and then you will be asked to select what service you want to use as a trigger. In the screenshot below I have selected the “Schedule” trigger. I can then hit continue and set up a trigger to activate every day, week or month. You will have different settings for each trigger service available. Make sure you configure these correctly and the save your trigger. Set up your action to send a letter. Now you will see the “actions” set up screen. You should now see Stannp as an option. You may have to search for us though. Then you can choose a Stannp action such as post a letter or postcard. After you pick the action you want you are asked to configure the post variables. 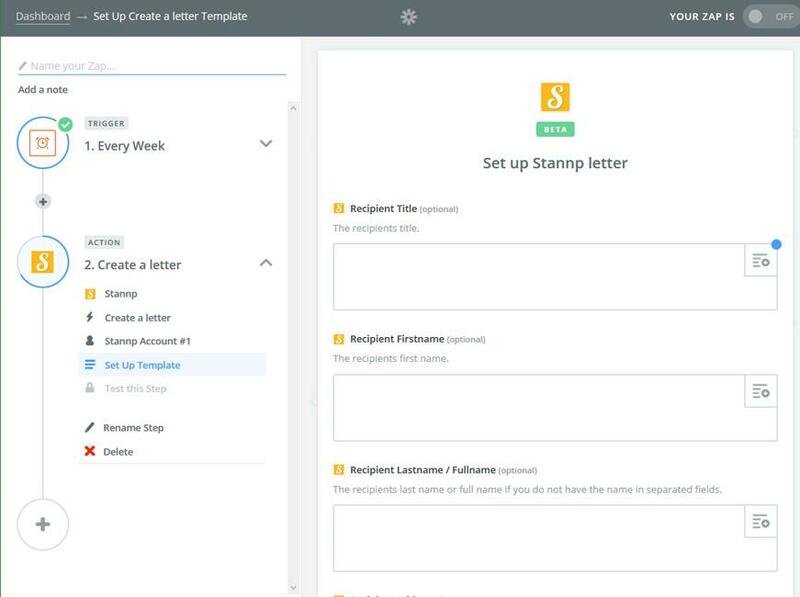 For example Stannp will need to know what address to post to and what letter template to use (Learn about creating templates here). You can use variables passed over from the trigger by clicking the button on the right of each input box. You can see it highlighted by a blue dot in the screenshot below. When your happy with your set up hit save. Make sure you run a test and then switch on your zap, and your done.